Reintroducing Hattie! – top down this time with sleeves worked in-the-round. 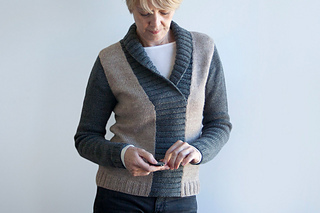 Hattie is a fitted, color block (if you choose) pullover with long, straight sleeves, and wide shawl collar. Stitches are picked up along center front and neckline edges for its ribbed front panel and collar. You’ll find worsted weight yarn works up quickly for a fun project. Enjoy! 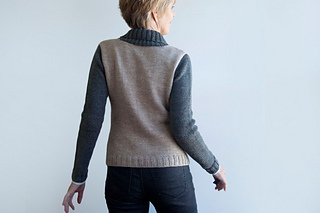 • sleeve and collar color (CC) – Charcoal Grey #8400; 3, 3, 3, 3, 3, 4, 4 skeins, or for comparable yarn, approximately 470, 510, 560, 615, 665, 720, 760 yards / 430, 470, 515, 565, 610, 660, 695 m.
Long-tail CO, Cable CO, circular knitting, decreasing (ssk, k2tog), increasing (m1R, m1L), short row shaping at shoulders and sleeve caps, setting in sleeves, stitch pick-up around neckline and center front, and seaming of rib panel to lower left bodice. 14 page PDF includes pattern instructions, photographs, schematics, a row tracking tool for managing at the same time instructions, and definitions for relevant abbreviations.